Home » Blog » Celebrating 18 Years! Today Kevin and Laura celebrate 18 years of marriage, and look forward to the rest of forever…! Knowing that marriage and family can last forever…! We’d love to hear how many years you have been married, and what the best things about marriage are for you. Share your favorite wedding anniversary traditions, as well. We can all learn from each other. What is a wedding sealing? Members of the Church of Jesus Christ of Latter-day Saints believe that marriages and families are not just “’til death do us part” but for forever–this life and the next. You may have seen an LDS/Mormon temple where marriage sealings are performed. This is where my husband and I were not just married but were sealed for time and all eternity. So on our anniversary (or around it) we go back to one of the temples (House of the Lord) and do sealings for others just like we did for ourselves when we were first married. I hope that answers your question. You could learn more about it at http://www.LDS.org under Gospel Library | Gospel Topics | Marriage | Additional Information. Congratulations! July 19th is our anniversary too! 13 years for us! 🙂 Where did you get married? 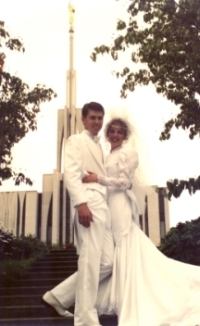 It looks a lot like the Seattle Temple, which is where we were married. We too love to do sealings. We also talk about where we’ve been, where we are now, and where we are going as a couple and a family. It’s a great time to update our family vision of what/where we want to be in 20 years. I really like the idea of making a tradition of spending the night alone together each each. What a fun tradition.